I love this book! Susan Elia MacNeal has crafted a smart, fun and inquisitive character in Maggie Hope. Maggie's an American student, on her way to study at MIT. Maggie's been raised by an aunt after the deaths of her parents in a car accident in London. When a grandmother she's never known dies, she inherits her grandmother's London home. So off Maggie goes, at the beginning days of WWII, to see about selling the home. Because of the war's onset, Maggie is trapped in London. She's unable to sell the home and quickly goes about renting out its rooms to a quirky and interesting group of supporting players. Susan Elia MacNeal opens the book with the death of a young woman. I love it when the action starts before you turn too many pages. Make no mistake, this isn't a fluffy piece of historical fiction, or maybe more precisely, a fictional historical mystery. Trust no one you meet in Mr. Churchill's Secretary, as not all are whom they seem to be and Maggie comes to realize that her world and the people in it, aren't always who and what she thought they were. Susan's character Maggie, reminds be just a teeny bit of the "Maisey Dobbs" character, in that they are both incredibly smart, young and are a bit miffed that because they are "female" they are limited in what the world around them allows them to do. Maggie Hope is her own modern woman and she fights to claim her own place in the world, even if it's not quite the way she expected it to be. Susan Elia MacNeal's research is incredibly detailed and accurate as needed historically. The story unwinds at a good pace and that makes it a very easy and enjoyable read. For me, the book moved quickly and smoothly and the characters and settings were perfect for me to suspend my disbelief. I'm excited to learn that there will be four more Maggie Hope books for us to enjoy, the next two will be, in order, Princess Elizabeth's Spy out this fall and then Hitler's Nightgale and a fourth that's still unnamed. 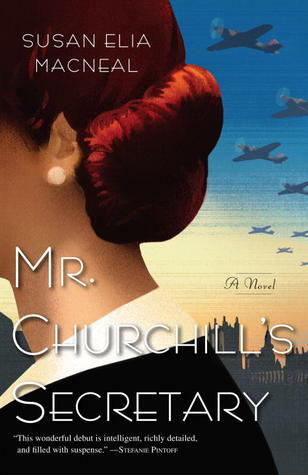 I give Mr. Churchill's Secretary 4 out of 5 stars! It's great, just read it! **I received this book through a GOODREADS early reader giveaway from the publisher, and this is my honest review of the book. Great review-thanks. It's good to hear that her historical research is accurate, it's something I appreciate in an author. I first heard about this one on The Book Report Radio Show(www.bookreportradio.com), Elaine played an extract of the audio book and it sounds really great! I have bought the book though haven't got to read it yet, but hope I enjoy it as much as you did!